This is where this gets a little tricky...I believe most people fail when they make their resolutions or set health and fitness goals because they are relying on too much detail; i.e. daily meal plans or lists of what they can and can't eat. Then one day you find yourself out of your routine or in a place that doesn't have the approved snack or food and it throws us for a loop. My background is in kinesiology and I do have a good bit of knowledge in nutrition, food science, and dietetics...but you can see how far those classes got me. Those are the same classes and coursework that your doctor or health care provider has taken in school. If you have read my blog or listened to the podcast, you know what my journey has been like and have hopefully seen my evolution in terms of how I eat now. *Spoiler Alert* I go back and forth between a ketogenic and low-carb variations of a primal diet. There are a ton of great resources out there and if you have established your "Echo Chamber" you probably know what some of them are. I also have some links in the gear section to some books that I have really enjoyed. When I was in the army, when we would call for fire support (artillery, mortars, etc.) we would use a technique called bracketing in order to hit the desired target. This would mean firing around the target area, long and short of it, in order to dial in the exact location. This is the same approach that I take to how I eat...that doesn't mean I throw food up in the air and hope to catch it in my mouth, but more in terms of macro-nutrient ratios. This is where I hope I don't lose you...I, as a rule, try to stay under 25 grams of carbs a day. Some days I might get to close to 50 grams, but not too often. I have come close to 100 grams twice, but that's because I was out and sweet potato fries are amazing. At the end of the day, it's really not that big of a deal because it's been twice in the last ten months (at the time of writing this). These numbers may change because I am doing a little experimenting with fueling for ultra-running, but that's the beauty of this whole eating thing, we need to experiment to see how we react and use epidemiological studies as a reference with the understanding that we are all different and will react differently. In Robb Wolf's book, Wired to Eat, he does a great job explaining at length about how the same food has one affect on him and a completely different one on his wife. It's a great read or listen, if you use Audible. So as we go forward, armed with the knowledge and support we've attained from our Echo Chamber, I want you to take an honest look at what you are eating. I want you to download a meal logging app...there are plenty out there, but I use(d) MyFitnessPal. I say do this because I want you to understand what your macro-nutrient ratio is. Don't worry about total calories or anything but macro-nutrient ratios. The average American diet is around 50% carbs. We want to work on getting that number down to below 10%-15%. Again, we want to find a ratio that works best for you...it might be more, it might be less. For me, I need to stay below 5%, but I will get up to 10% at times. Now that you've downloaded your tracker, just log your meals for a week or so. The whole point of this exercise is to find our points of failure. Once we have identified that point, then we can make our adjustments and move beyond it, instead of backsliding. When I would train people, one of the maxims that I say is "Do it until you get it wrong." The whole point is to find where the breakdown is. Once the problem is identified, we can make our adjustments and keep progressing. One of the failure points that I had was fear of bad breath...actually the fear wasn't the failure, it was how I dealt with that fear. I would eat Altoids by the handful. In three Altoids, there are 2g of carbs. Some days I could get 15g of carb from Altoids! Once I realized this, I was able to find different options for freshening my breath without adding unnecessary carbs. My major point of failure would be paralysis by analysis. This might sound strange, but I was trying to track so many health metrics, that it was exhausting and it was being counter-productive. I was tracking sleep, heart rate variability. VO2, calories, blood glucose, blood pressure, steps, reps, RHR, etc, etc, etc. I was trying to track so many metrics like I was an athlete again and not a regular guy with a day job, family, pets, mortgage, etc. The scientist in me loved the metrics, but it was doing more harm then good. 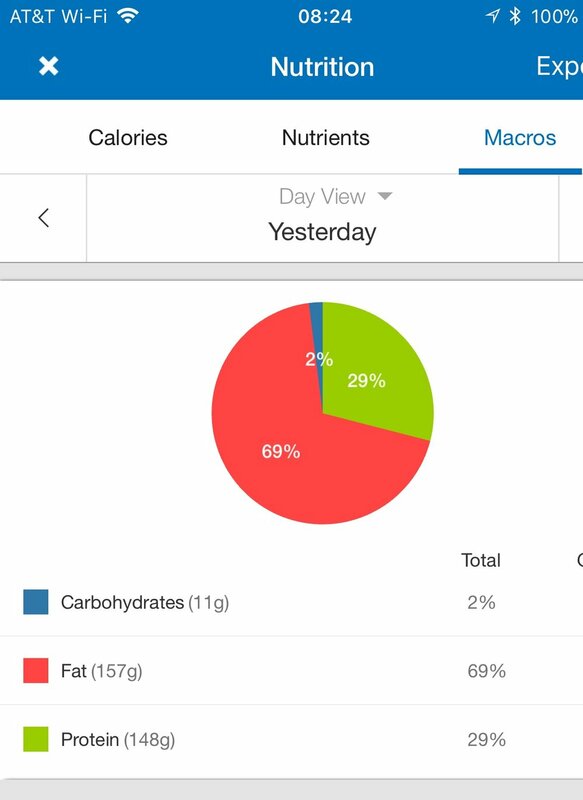 When I decided to go keto, I told myself that I wasn't going to do any more metrics...only macros. Since I've simplified it, it's made my journey a lot easier. So back to MyFitnessPal, log your food and take a look at what you find. I like MFP because you can take pictures of bar codes on food labels and it will add it to your diary...it's just simple and easy to use. The whole point of this exercise is not to make you reliant on the app, but to help you understand the nutrient breakdown of what you eat. In my experience, most people are habitual and eat a lot of the same thing, so the complaint about limiting what you can or can't eat really is a non-issue; especially when you can find a low or no-carb alternative to any food you can imagine. Once you've learned what's in your food, it's understanding how to tailor how you're eating. I recommend beginning with keeping your carb ratio at 5%. This is easier than you think. Bacon and eggs are your friends. With a few key strokes or asking Siri, you can find a lot of keto or low-carb foods. I'm not here to re-write information that is already readily available, so put in some due diligence and it will pay off. If you've created your Echo Chamber, this shouldn't be very difficult. Here is a screen grab from MyFitnessPal app. As you can see, I do a little more protein than traditional keto diets, so it's more of a low carb than a traditional keto. One of the other components to nutrition that I have had looked into and now implement is time restricted eating and intermittent fasting. There's a lot of great research available on this. If you follow Found my Fitness, there is some great podcasts and information on this; specifically the podcasts with Dr. Satchin Panda. Why I began TRE and IF is because I had lost so much weight, my skin was getting lose. I remembered one of the Paleo Solution Podcasts. Episdoe 352 with Jimmy Moore and Jason Fung, and they discussed utilizing IF/TRE with morbidly obese patients with the fasting protocols, none of the patients required surgery to remove loose skin. Since I have been doing TRE, I have noticed my skin tightening and I don't have the "skin flaps". As you progress on your journey, you will start to learn what works for you and what doesn't. Don't be afraid to experiment with macro ratios. I will say this, embrace fat. If it says low-fat, don't touch it...in fact, run from it. Fat is where most people go wrong when embracing a low carb lifestyle. Cook with Butter, not margerine. Start adding MCT oil to coffee and tea. Pork Rinds are great! Add salt to everything...just not Mortons salt...think Himalayan, Celtic, etc. Pretty much everything that you have been told. learned, or lectured to not do....do it. For those that drink lots of pop or soda...stop. Discover things like LaCroix, flavored carbonated water like Perrier...they're easy to find now a days. The carbonation in these beverages will help trick you and the pleasure centers that love pop or soda and you will actually start to like them. For me, I don't have an adverse reaction to dairy, like some do, but I do avoid milk. There's around 12g of carbs from sugar in a glass of 2% milk. This is another one that gets people, so avoid it. You will figure out other dairy products along your way. One more thing to watch out for, your taste buds are going to change when you go low carb. Fruit will taste sweeter, sugary beverages and foods will be too sweet to tolerate. If you go by what you have heard in your echo chamber, this will be an easier transition than you think. If you need to supplement, there's a lot of information out there. I take fish oil, vitamin d, magnesium, and potassium consistently. I've experimented with other things, but haven't really noticed a difference with any of them. However, it depends on what you're trying to accomplish. I am not saying anything negative about supplementation, because it is necessary in some cases. For me, I never experienced "Keto Flu" or anything like that, so I can't speak to that. By this point, you're going to have an idea of what direction you want to head, just keep yourself accountable by writing it down and sticking to it. If you want to stay under 15g of carbs 3 days a week, than write that down on Monday and do it. If you want to try TRE or IF, write it down and do it. One of the hardest things about doing this, is re-wiring yourself into thinking that it is ok to eat a lot of bacon and to cook with real butter. To come to the reality that most commercially ready "healthy food" is not actually healthy for us. The sooner you come to terms with that, the easier it will be. And just so you're ready for it, every skinny person or just every person that you know who sees you cook or sometimes eat, will tell you how bad that is for you. I've lost over 100 lbs and I still hear it from a lot of people who my pork rinds are going to give me a heart attack. If you think you are alone, you are not. I've been through it and so have a lot of people. Just know that you are on your way to becoming the best version of you.